Note: While this guide was written primarily for the LIDAR-Lite v3, it can be used for the LIDAR-Lite v3HP. 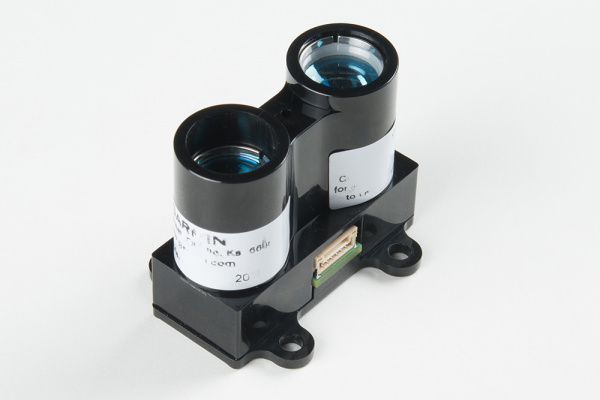 The LIDAR-Lite Series - the v3 and v3HP - are compact optical distance measurement sensors, which are ideal for drones and unmanned vehicles. LIDAR is a combination of the words "light" and "RADAR." Or, if you'd like, a backronym for "LIght Detection and Ranging" or "Laser Imaging, Detection, and Ranging." At it's core, LIDAR works by shooting a laser at an object and then measuring the time it takes for that light to return to the sensor. With this, the distance to the object can be measured with fairly good accuracy. By sweeping or spinning a LIDAR unit, systems can create detailed distance maps. Survey equipment, satellites, and aircraft can be equipped with complex LIDAR systems to create topographic maps of terrain and buildings. 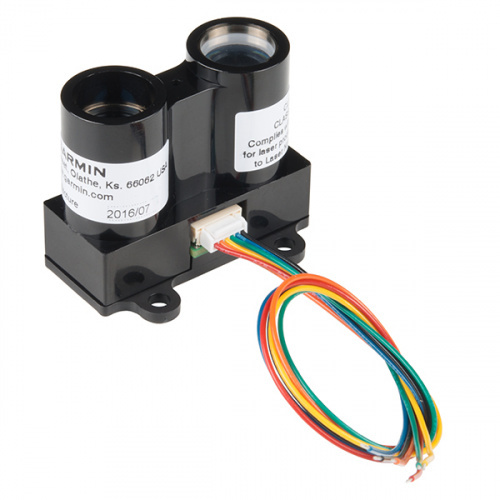 Luckily, Garmin™ has created a user-friendly LIDAR unit for your robotics and DIY needs! Note that these use a Class 1 Laser, if you are concerned about your safety (in short: A Class 1 laser is safe under all conditions of normal use). CLASS 1 LASER PRODUCT CLASSIFIED EN/IEC 60825-1 2014. This product is in conformity with performance standards for laser products under 21 CFR 1040, except with respect to those characteristics authorized by Variance Number FDA-2016-V-2943 effective September 27, 2016. What is the difference between the LIDAR-Lite v3 and the LIDAR-Lite v3HP? Let's ask Shawn Hymel! Note: An IPX7 rating means that the body of this device can withstand incidental exposure to water of up to 1meter for up to 30 minutes. The bare wire portion of the wiring harness is not water resistant. All bare wire connections must either be made in a water tight location or properly sealed. The LIDAR-Lite has two tubes on the front that contain a transmitter (laser) and receiver. You'll want to face these toward your target. On the side, you'll find an electrical port that connects to the included 6-wire cable. Plug in the wire harness to the port to break out the pins. On the back, you'll find 4 mounting holes that are designed to accept #6 or M3.5 screws or bolts. 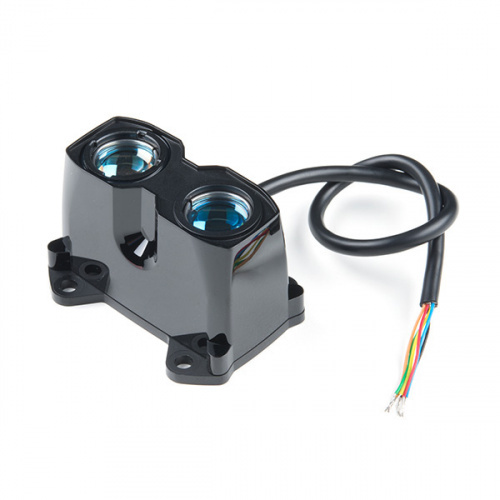 The LIDAR-Lite has 6 wires that can be used to communicate with the sensor. Note: V3&apos;s pinout, default address I2C (0x62), and overall functionality is the same as other versions. However, the connector and cable for the V3 are different compared to V3HP and V2. Both the LIDAR-Lite v3 as well as the LIDAR-Lite v3HP units require between 4.5V to 5.5V of DC power to operate (nominally, 5V). 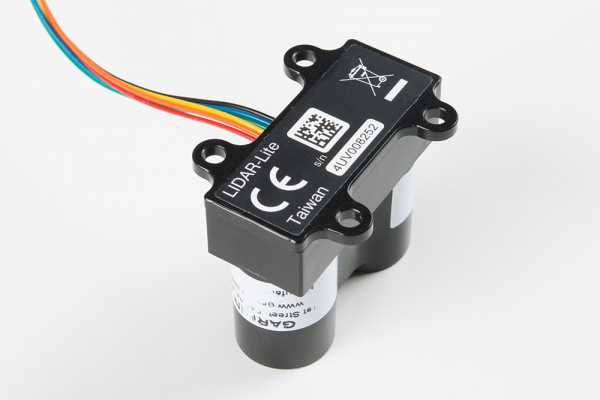 The LIDAR-LITE v3 can draw up to 135 mA of current during continuous operation (105 mA at idle). Contrarily, the v3HP unit draws up to 85 mA of current during continuous operation (65 mA at idle). To maintain a level voltage, Garmin recommends putting a 680 μF capacitor between power (5V) and ground (GND) as close to the LIDAR unit as possible. 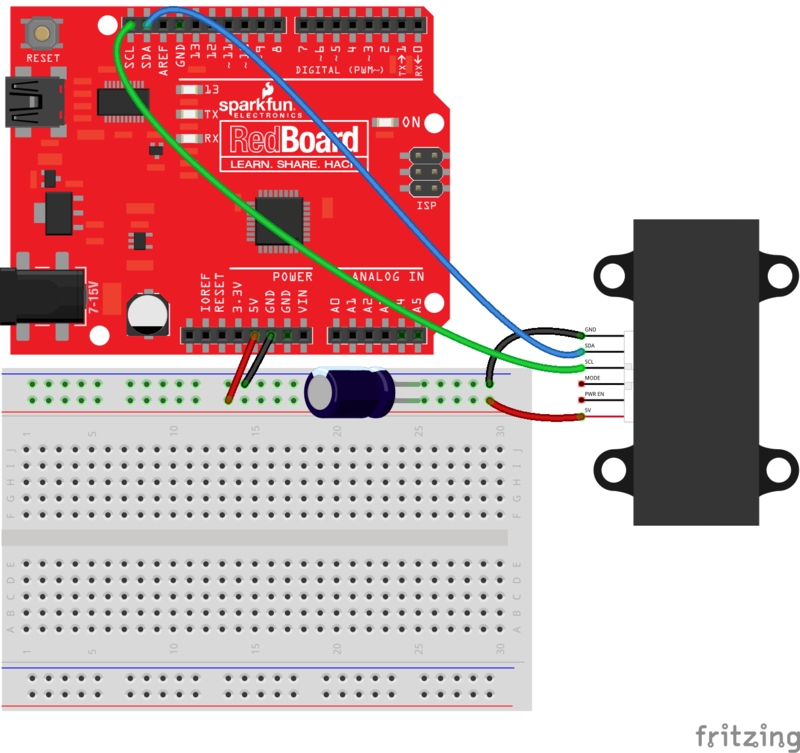 Follow the diagram below to connect the LIDAR unit to a RedBoard or other Arduino-compatible board. The LIDAR-Lite can communicate over I2C as well as use a pulse-width modulated (PWM) signal to denote measured distances. 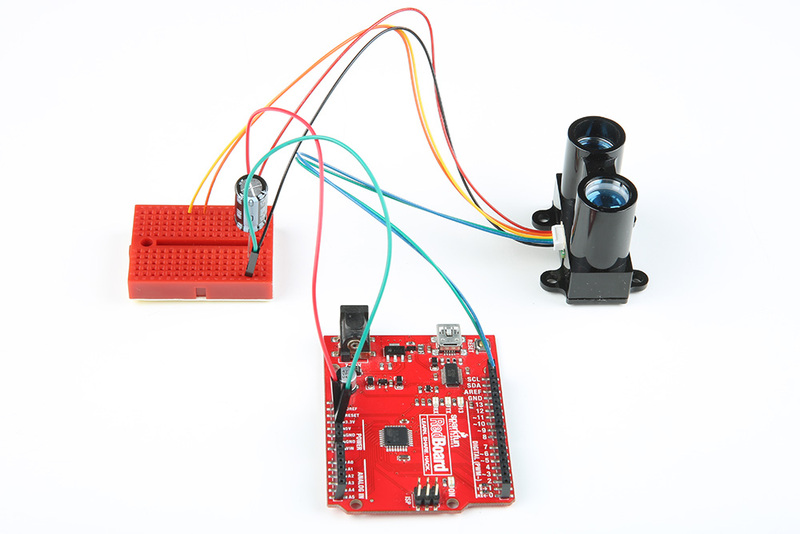 For this guide, we will show how to use I2C to communicate with the LIDAR unit. Note: Garmin recommends a 680 μF, but anything near that value will work. I used a 1000 μF capacitor in this example. Make sure to add the electrolytic capacitor correctly to the circuit since it has a polarity. Garmin maintains an Arduino library to make working with the LIDAR-Lite very easy. Visit the GitHub repository, or click the button below to download the library. 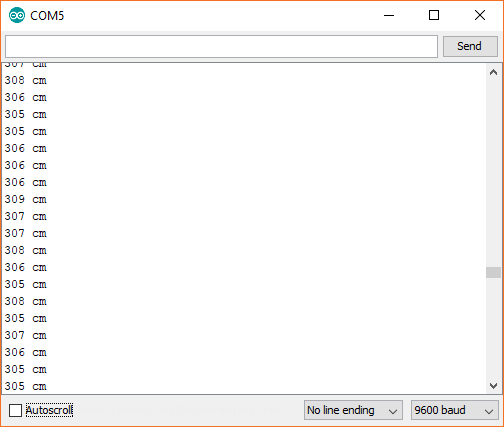 Upload the program, and open a Serial Monitor. You should see distance measurements (in cm) being printed. Are you seeing this output from the LIDAR-Lite V3 I2C example code with the decoupling capacitors connected to the Arduino? You probably do not have a secure connection between the Lidar and the Arduino. I2C is sensitive to its connection. The cable wires are thin and can disconnect when in the Arduino's female header from a bump. A breadboard seems to work fine if there is not a lot of mechanical vibrations. However, a small bump can mess up the timing for the I2C even on the breadboard. For a secure connection, it is recommended soldering header pins with some heat shrink or make sort of adapter when connecting it to an Arduino. 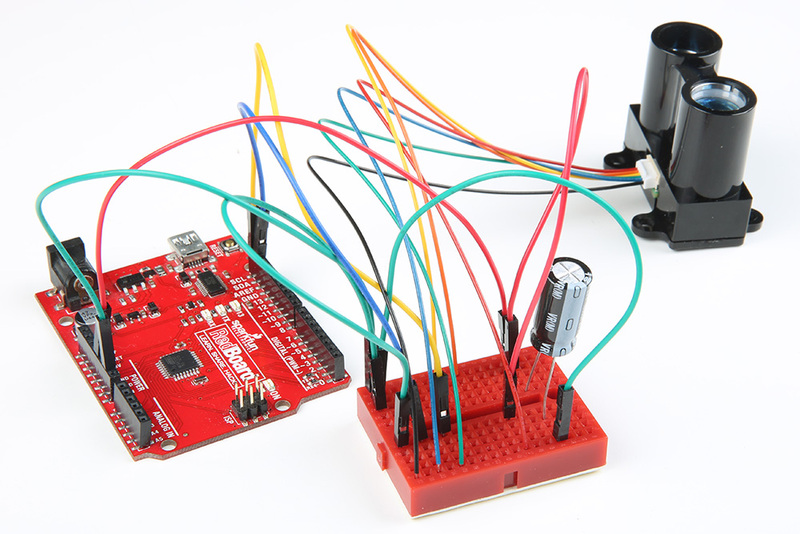 Once disconnected, the Arduino might stop outputting sensor data. You can reset the Arduino for testing but to prevent the wires from disconnecting, it would be better to solder the wires to header pins. This is a common "issue" with any I2C sensor and if they do not secure the wires, the Arduino will have problems talking with the Lidar Lite V3. Looking for a 680µF capacitor? Unfortunately, the SparkFun catalog does not include a 680µF capacitor. There are 1000µF capacitors, which can work as a substitute with the Lidar Lite. Or, you can also wire capacitors in series and parallel to get an equivalent capacitance. For more details on the dimensions, check out the links below. He happened to have a 5V/16 MHz Pro Micro around when building the project for the Lidar Lite V2 Glasses. 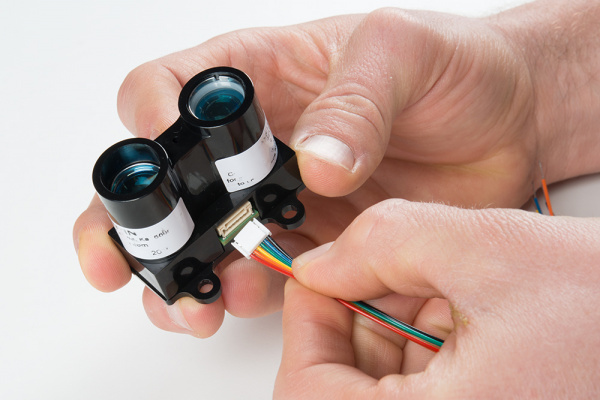 The parts were reused for the Lidar Lite V3 Wand. 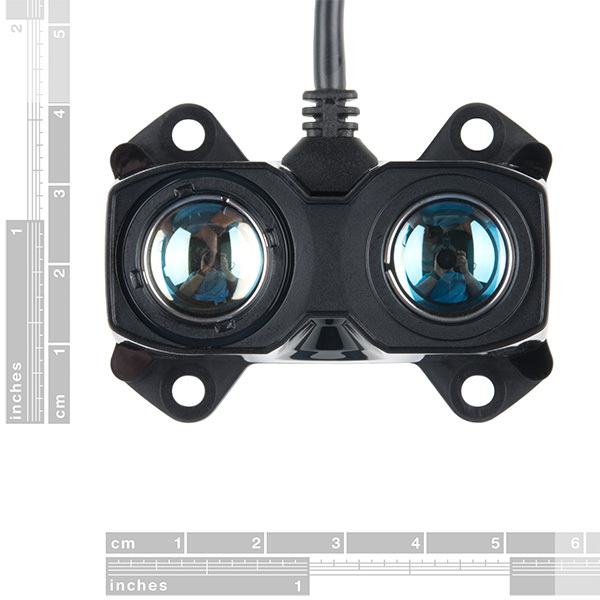 Try looking at the old wishlist for the Lidar Lite V2 Glasses for more information. Make sure to also add a 1k&ohm; resistor when using the PWM wiring as stated on page 3 of the user manual. For more application notes on using the LIDAR-Lite v3/v3HP, check out the link below. This can also be found in the operation & technical manual on page 11. Now that you've successfully got your LIDAR up and running, it's time to incorporate it into your own project! Fritzing Diagram - The old Fritzing Part can be found from this repository. 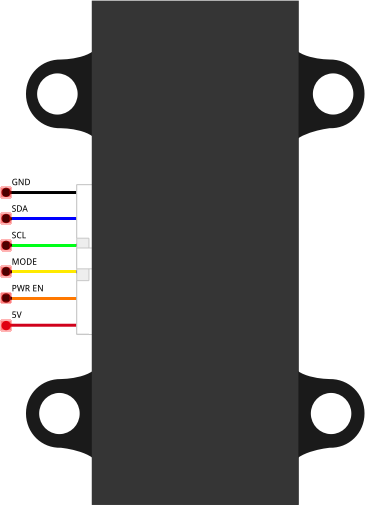 The pinout is the same so it can be used to represent the LIDAR-Lite V3. Or check out these 3D Scanner projects using the LIDAR-Lite V3. Or check out these related blog post.